A clear & personalized path for discipleship. Discipleship can feel like a meandering journey - we don't know what we want, and none of the programs offered seem to get us anywhere. We need something to orient ourselves, something to direct our steps toward a clear destination. Simple Discipleship, with its companion assessment tool, offers a plan for discipleship that is tailored to your life and your personality and clearly pointed in the way of Jesus. Most discipleship resources are designed as mass productions - efficient for touching many, but often failing to see individuals grow in Christ. This book offers the best of both worlds - an assessment tool for your entire church, combined with an achievable, personalized discipling strategy. The church exists to make disciples. 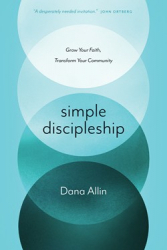 Dana Allin issues here a desperately needed invitation to embrace our assignment with urgent grace and eager hearts. - John Ortberg, pastor & author.